Dan Willard is an Ojai sax player available for weddings, parties, and other events in Ojai, and surrounding areas. 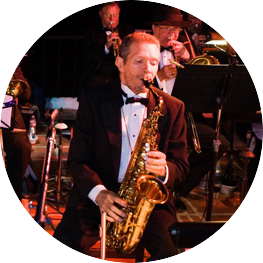 Dan has been playing the sax for more than 40 years and is experienced in many styles including jazz, Big Band, swing, Dixieland, R&B, smooth jazz, classical, and rock. He performs regularly in musicals presented at the Ojai Art Center Theater, The Thacher School, and Nordhoff High School. He is available as a soloist or with accompaniment ranging from a duo with piano or guitar to a small jazz combo with piano, bass, and drums or even a 17 piece Big Band. Dan is also a vocalist and in addition to sax he also plays clarinet, flute, and trumpet. He is also available for events in Santa Barbara, Ventura, Santa Ynez Valley, Simi Valley, Westlake Village, Thousand Oaks, Los Angeles, and many other locations. For more information and to hear audio clips please click here.